With the ongoing Bundy family militia takeover of a federal wildlife refuge in Oregon as a backdrop, several Republican Colorado lawmakers said they understand citizen frustration with federal government mismanagement of public lands, but they stopped short of committing to more state-control legislation this session. A Colorado Democrat, meanwhile, told The Colorado Statesman she plans to introduce a bill supporting the current system of federal ownership and management and opposing state or private takeover of public lands. “It’s something that’s still on a lot of people’s minds as far as who controls the land, whether it’s local or the federal government,” said state Sen. Randy Baumgardner, R-Hot Sulphur Springs, who last session ran an unsuccessful bill to study how the state might assume control of federal lands and the potential economic benefits of such a move. But Baumgardner told The Statesman he’s “already billed up” and at his limit of five proposed laws, and that he won’t take another stab at what would be a largely symbolic bill with little chance of passing in the Democrat-controlled House. However, he added it’s an important discussion given how poorly the 37 percent of Colorado controlled by the federal government is being managed. In particular, he points to the lack of logging and the mountain pine bark beetle infestation that has ravaged the forests in much of his district and made it arguably more susceptible to wildfire. Sen. Kerry Donovan, D-Vail, has the exact opposite opinion of federal land management policies, and she cites public polling that shows overwhelming support by a majority of Coloradans for the current system of public lands management. That’s a bill that may have a hard time making it out of the Republican-controlled Senate, where Western Slope lawmakers like Sen. Ray Scott, R-Grand Junction, say the federal government has gone too far with actions like closing recreational trails for Jeeping and ATV riding on public land and blocking oil and gas drilling and other extractive industries. Scott, who said he would support state-control legislation but is not necessarily running such a bill, told The Statesman that states with lower percentages of federal-land ownership are having a better time economically. He cited the 3.9-percent federal land ownership in North Dakota, where a recent fracking boom in the oil and gas industry ignited the local economy. 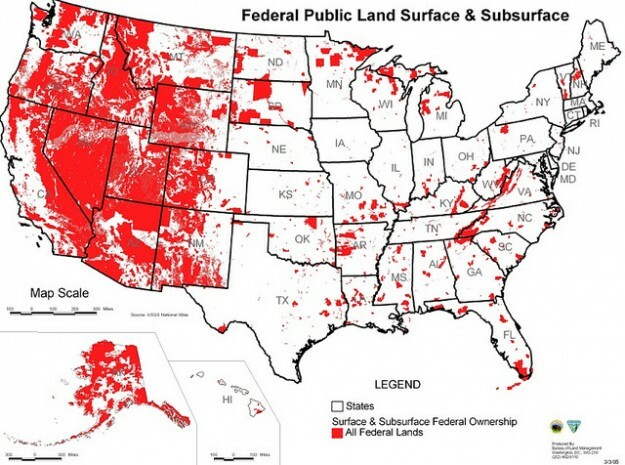 Federally owned lands, managed by the U.S. Forest Service, Bureau of Land Management, National Park Service and other agencies, operate under a multiple-use philosophy that does allow for mining, logging, grazing, outdoor recreation and other public uses, but typically under fairly stringent permitting guidelines. Bills were introduced in 11 western states last year to promote some form of state or private control of federal lands, although critics have called such laws constitutionally questionable. State lawmakers from Oregon and Nevada have reportedly either spoken to or met with the Bundy family near Burns. State control of federal lands was also a hot top during the 2014 elections in Colorado, where Republican challengers railed against federal overreach and ballot questions were contemplated. Utah’s legislature last year passed a bill demanding the federal government turn over control of more than 20 million acres of land in that state, which is 66.5 percent federally owned – second only to Nevada at 81 percent. Colorado state Rep. Gordon Klingenschmitt, R-Colorado Springs, told The Statesman that high percentage of federal ownership in Nevada is one of the reasons the Bundy family hails from there and is now spreading its protest movement to other western states like Oregon. But Klingenschmitt made it clear he does not support violent protest. “When you see the same thing happening in Oregon – and by the way I repeat that I specifically denounce any acts of violence by protesters – there needs to be some kind of peaceful protest to get people’s land back from the takers,” Klingenschmitt said. Critics of the state-control movement say its rhetoric is inciting a minority fringe of extremists to take drastic and dangerous action. “Charges of government overreach from the ideological fringes are making headlines, but in reality most westerners in [a new] poll favor greater protection and sensible use of the open lands and national treasures that define the region,” said Eric Perramond, professor in the Southwest Studies and Environmental Programs at Colorado College, which released a new survey on the topic Monday. The State of the Rockies Project Conservation in the West Poll found 59 percent of the residents of seven Mountain West states, including Colorado, oppose giving state governments control over public lands and 59 percent oppose selling significant chunks of public lands to reduce the budget deficit.